of Indian Coast Guard i.e. www.joinindiancoastguard.gov.in/. 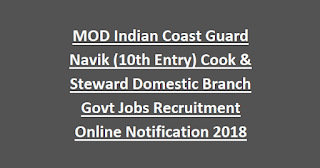 Online applications for this ICG Navik Cook & Steward vacancies will be accepted from 15-10-2018 to 29-10-2018. Candidates who are qualified 10th class they are eligible apply for this Indian Coast Guard Navik Jobs. Selection for this ICG vacancies will be based on Written Exam, Physical Fitness Tests (PFT) and Medical Tests. 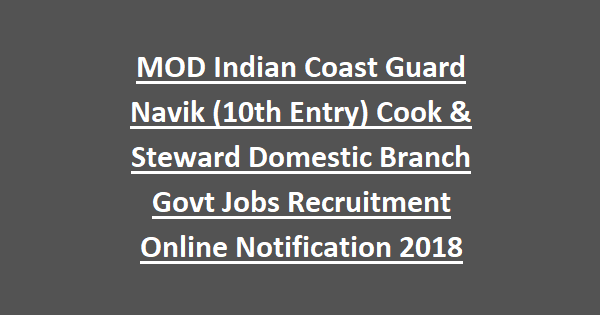 For more details regarding Ministry of Defence Indian Coast Guard Navik Cook & Steward vacancies in Domestic Branch Recruitment 2018 is mentioned below. Selected aspirants will get the Pay Scale of Rs.5200/– to Rs.20200/- per month along with Grade Pay of Rs.1900/- plus Dearness Allowance (DA), Kit Maintenance Allowance, other liberal allowances. It should be in between 18 years to 22 years as on 01st April 2019. So candidates born between 01st Apr 1997 to 31 March 2001. Upper age relaxation of five years for Scheduled Caste/ Scheduled Tribe candidates and three years for Other Backward Classes candidates. 1. Short listed candidates will be called for Written Test. It is an objective type. 2. Candidates will be short listed on the basis of higher education and percentage of marks in the respective categories. 3. Those who qualify in written exam will be called for Physical Fitness Test (PFT) and Medical test. Syllabus will be 10th class level only. Interested candidates can submit Application forms online through the Indian Coast Guard website i.e. www.joinindiancoastguard.gov.in/ and fill with required details. Last date for submission of application form online is 16-02-2018. Submit 10th marks with decimals also..